From the desk of Geoff Johns: "It had to happen sometime, it’s just happening a little sooner than we planned. The “Titans East” storyline beginning in today’s TEEN TITANS #43 will be our last." " So whenever you leave a book there are two questions: 1) Why are you leaving? And 2) Who’s taking over? It’s never easy leaving a book, but after nearly 4 years on TEEN TITANS, I felt it was time to let someone else take the teens on. Some of my friends have asked, “Why not stay on until Teen Titans #50?! You’re so close!” But it’s like when I left THE FLASH after “Rogue War” - even though I found out later there were only a few issues of the series left because of what they wanted to do, I felt it was the right time to go. That doesn’t mean I’ll never write TEEN TITANS or THE FLASH again if I have the opportunity. I hope I do." [..] " So now…who’s taking over? That would be current Robin scribe Adam Beechen beginning with TEEN TITANS #47. " "Some people have already seen his name solicited on upcoming issues of “Titans East” – that’s because Adam’s come on early to co-write “Titans East” with me to get a sense of the team and to set the stage for his run as I close out mine. There are going to be some shake-ups and, more importantly, you will see the beginnings of a second Titans team forming…though not necessarily what you’re expecting. 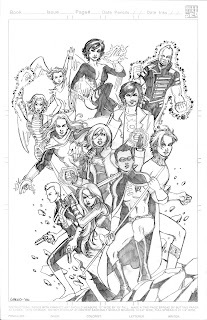 Adam’s especially nailed the characters of Kid Devil and Miss Martian and he’s delved head first into the vast Titans history to soak it all up." Read the full article at Newsarama. Geoff, it's been a fun ride! and look for Teen Titans #43 THIS WEEK! So What's Up With Power Boy? Is Power Boy another Titan gone wrong? in DC NATION #45, SUPERGIRL editor Eddie Berganza reveals: "Now, she has a new love interest in Power Boy, a "hero" that Ian designed, keeping in mind the great attributes that are usually associated with female characters…and the reason most women don't like the super-hero genre. Like the chest window of his costume? His constant posing? Yes, he's a mimbo, but he'll be a lot worse to Kara when issue #15 hits. Then things heat up for the last daughter of Krypton with #16, when Joe is joined by new artist Ale Garza (as Ian will eventually be going on with Joe to one of my other books) and co-writer Mark Sable for a story arc that runs through issue #19, which will delve further into the fragments of Kara's past and give us a new understanding of the character." Deathstroke’s true motives are revealed as the shocking conclusion of “Titans East” explodes! Who has come to aid in the fight against Slade’s boys and girls? And what new team of Titans — East and West — will rise out of the ashes of this epic battle?! Acclaimed fantasy writer Tad Williams continues his run on the title that’s already garnered a great deal of attention! Black Manta is trying to move in on the remains of Sub Diego, and Tempest tries to help Arthur recover the Trident of Poseidon! Newsarama reports: "As hinted at – heavily – in the weekly 52 series (and seen briefly in Justice Society #1), sometime before the 52 ends, World War III will shake the world. Actually, the date for the war is pretty specific – it will occur in Week 50 of 52. But – war is big and messy. As such, it sometimes can’t be contained to one series or one issue. To get the larger picture of the war, DC has confirmed for Newsarama that there will be four one shots shipping during Week 50 as well, all tied to the events of World War III." DC has provided Newsarama the full solicitation copy for the four April World War III specials..
WORLD WAR III PART ONE: A CALL TO ARMS: Written by Keith Champagne; Art by Pat Oliffe & Drew Geraci; Cover by Ethan Van Sciver; It is a day of infamy. Chaos has broken out across the globe, and Firestorm and Firehawk are among the many mobilizing to stem the flow of blood and thunder. WORLD WAR III PART TWO: THE VALIANT: Written by Keith Champagne; Art by Andy Smith & Ray Snyder; Cover by Ethan Van Sciver; The war rages on, extending from the far reaches of space, where Supergirl encounters a missing hero, to the darkest depths of the ocean, where the fate of Aquaman is revealed. WORLD WAR III PART THREE: HELL IS FOR HEROES: Written by John Ostrander; Art by Tom Derenick & Norm Rapmund; Cover by Ethan Van Sciver; The horrors of war become grim reality for the Teen Titans, as they suffer the loss of one of their own. WORLD WAR III PART FOUR: UNITED WE STAND: Written by John Ostrander; Art by Jack Jadson & Rodney Ramos; Cover by Ethan Van Sciver; Through the fog of war, a hero is reborn, and the DC Universe bands together against the wrath of an ancient evil! Titans Together! This is a commission I just completed for Jay over at the GeoffJohns.com forums. It consists of his 'perfect Titans team': Robin, Terra, Rose Wilson, Beast Boy, Anima, The Ray, Redwing, Argent, Pat Trayce Vigilante - and his own creations Zavrian [a mage] and a GenX Green Lantern dude. I had a lot of fun doing this one! Click to get a better look.